Coordinates Lat N 42:03':26" Lon W 89:20':40"
In the 1830's and 1840's an organized criminal gang known as the Banditti of the prairie was active on the Midwestern frontier. In 1841 six members were arrested and held for trial in Oregon, Illinois. On March 21, the day before the trial, the new Oregon courthouse burned. In retaliation , a group led by W.S. Wellington organized the regulators and ordered several suspected Banditti to emigrate or be whipped. Some left but those remaining forced Wellington to resign as regulator leader. He was replaced by John Campbell. A Banditti leader John Driscoll, and his four sons (Pierce, William, David, and Taylor) made a career of horse stealing and murder. 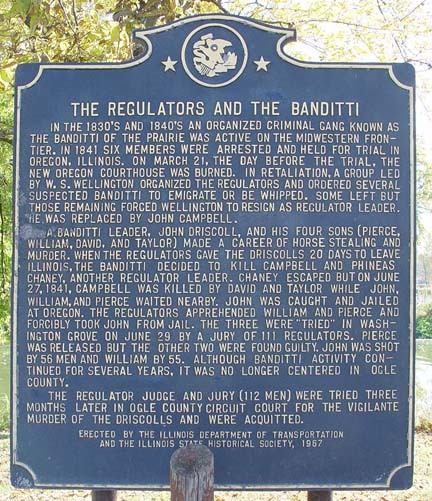 When the regulators cave the Driscolls 20 days to leave Illinois, the Banditti decided to kill Campbell, and Phineas Chaney, another regulator leader. Chaney escaped but on June 27, 1841 Campbell was killed by David and Taylor while John, William, and Pierce waited nearby. John was caught and jailed at Oregon, the Regulators apprehended William and Pierce and forcibly took John from jail. The three were tried in Washinton Grove on June 29 by a jury of 111 Regulators. Pierce was released but the other two were found guilty. John was shot by 56 men and William by 55, Although Banditti activity continued for several years, it was no longer centered in Ogle county. The Regulator judge and jury (112 men) were tried three months later in Ogle county circuit court for the vigilante murder of the Driscolls and were acquitted.